Homeowners love fireplaces. More and more, the fireplaces that homeowners are opting for are gas fireplaces. Whether you are looking to install a new fireplace in your home or you are looking to replace your existing fireplace, you should be aware of the advantages of contemporary gas stoves and fireplaces over their traditional counterparts. Traditional gas fireplaces and traditional gas stoves feature B-vent ventilation. That is, they require a chimney to be vented through the roof like a wood-burning fireplace or stove would need to be. This provides an exhaust for smoke and soot. Contemporary gas stoves and contemporary gas fireplaces are different. The most popular contemporary gas hearth appliances are direct vent. These gas appliances can be vented directly through a wall. 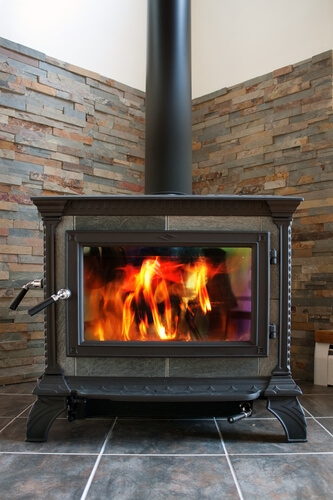 This makes installing a gas fireplace easier and more convenient; a direct-vent stove can be installed nearly anywhere in a home that a vent can be installed through a nearby wall or ceiling. For homes that don’t have a convenient location for a direct-vent fireplace, ventless gas stoves are another contemporary option. Direct-vent and vent-free contemporary gas stoves and fireplaces aren’t just easier and more convenient to install; they’re also more energy efficient. While traditional gas hearth appliances draw air from your home to fuel their flames, direct-vent gas fireplaces feature two vents in their chimneys. One exhausts the fireplace, while the other draws air from outside your home to heat the flame. This closed system reduces the amount of heat lost from your home to the fireplace, increasing its efficiency. Direct-vent gas stoves are even more energy efficient because none of the heat generated by the fireplace is lost through a chimney vent. When many people envision a gas stove, they envision artificial blue flames dancing around unrealistic manufactured logs. Today’s gas heating stoves have come a long way from these origins. Contemporary gas stoves and gas fireplace have realistic yellow, orange, and red flames, and ceramic logs are no so finely and realistically crafted that you can find them in a variety of wood types to suit your taste. Many gas heating stoves and fireplaces even have beds of glowing embers to more closely mimic a real fire. Another advantage to contemporary gas stoves is that they come in a variety of styles to suit your taste. You can find traditional and even rustic designs that very closely resemble traditional wood-burning stoves. Or, you can opt for a modern look, with a metal hearth, clean slick lines, and fires that burn around smooth river rocks, gas stoves or that seem to float in the fireplace. If you’re ready to upgrade your home with a contemporary gas stove, Tri-County Hearth & Patio is the place to look! We carry a variety of contemporary heating stove, so you’re sure to find the one you love. We also employ hearth experts who can answer all of your questions about contemporary gas stoves and help you select the right fireplace for your home. Stop by our showroom to start shopping for your contemporary gas fireplace today! I found myself in Tri-County Hearth & Patio when I was shopping around for outdoor furniture for my new pool and was amazed at the selection and quality of the merchandise. Plenty of displays helped me with deciding what I wanted for my home and the sales staff was more than willing to take the time to help me and make sure I get exactly what I was looking for. I had my furniture in no time and when it was delivered they assembled it on location and placed the furniture exactly where I wanted it. Overall a wonderful experience!